Buy Takenoko and PriceWatch, Buy this board game at the Lowest Price. 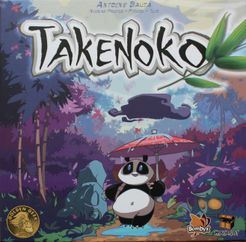 At first glance, it is tempting to think Takenoko, from Asmodee is so cute that it can't be a good game. The adorable panda you are tasked with caring for can easily lead you astray. Don't be fooled! This is a great game for many of the same reason Ticket to Ride and Settlers of Catan are great games. Each one is easy to learn, encourages strategic plays and winning is more about gaining points for yourself than defeating your opponent. The beautiful, high quality components combined with the solid mechanics make this game a joy to look at and even more fun to play. When you first open the box you will find a clear and straight forward rulebook with an introductory comic, a game board for each player, many wooden bamboo stalks and irrigation pipes, garden tiles, a weather die, plot improvement tokens, action markers, and two well painted plastic figures: a gardener and a panda. Everything fits nicely in the box for easy set up and storage. The rule book is well organized and very clear allowing even the first game to go from start to finish before anyone remembers they still have dishes to clean or laundry to wash. To begin the game, each player receives 3 objective cards, a game board, and two action tokens. The special pond tile is placed in the middle of the table with the gardener and the panda on top. Each turn a player will roll the weather die, and choose two of the 5 possible actions. Objective cards are completed when certain criteria are met including feeding the panda particular types of bamboo, placing garden tiles according to the emperor's tastes, and cultivating certain amounts and types of bamboo. When a player has completed 7-9 objective cards (depending on the number of players) the game ends and points are tallied to determine a winner. 1) Expand the garden: Choose one of the top three tiles from the garden tile pile, and place it on the ever growing board, starting from the pond tile in the middle. Some garden objectives require a certain layout of tiles to complete. It may take you several turns to find the right tiles and place them in the right orientation. 2) Gain an irrigation pipe from the supply: Irrigation allows you to water tiles so that bamboo can grow. You may place an irrigation pipe as soon as you acquire it or wait until you have enough to irrigate a tile far away from the water. The start tile is a pond that can be used to irrigate other tiles directly connected to it or connected through irrigation pipes. 3) Move the Gardener: Bamboo grows on the tile where the gardener lands as well as connected tiles of the same color. Growing enough of the right colors of bamboo can complete the gardener objective cards. 4) Move the Panda: The panda will eat bamboo from the tile he lands on. Feeding the panda enough of the right kinds of bamboo complete the panda objective cards. 5) Draw a new objective card: There are three different types of objective cards; panda, garden, or gardener. They are separated into three piles and you can choose the top card of any one pile. Grow any one bamboo stalk. Choose the same action twice. Place the panda anywhere on the board. It eats one shoot of bamboo. Gain a tile improvement that can be placed anywhere at any time during your turn. Wild card! Pick any other side of the die. Because two of the sides of the die allow you to effectively pick an extra action, and one side allows you to complete an action twice, the die does not greatly increase the randomness of the game. I appreciate a very small amount of luck in a game, but do not like feeling that my choices are unimportant because I rolled the wrong number. This game balances the luck very well. While the rules are simple deciding when to draw new objectives cards, where to place new tiles, and how many actions to dedicate towards one goal are all strategic and interesting without causing analysis paralysis. Although this is one of the most adorable and beautiful games I own, it is more than a pretty face. I would easily recommend this game to anyone who is looking for a great introduction to Euro games or even adding to their collection. With an average play time of 30-45 minutes, it is easy to fit in between other longer games, or while waiting for the rest of a board game group to show up. It is also one of the few Euro games that I would really recommend as a good two, three or four player game. Most games are really only fun with 3 or more, but this one is the same with more or fewer players. While it seems unlikely that this game will steal sales from more well known games like Ticket to Ride or Settlers of Catan, I think it is just as fun, as easy to learn, and much more beautiful than either one. If this sounds like your cup of tea, go ahead. Every panda needs a good home.